WiFi infrastructure is everywhere which makes easier to make network of devices connected to WiFi. There is also great range of WIFI routers with different space coverage and speeds, and as they are mass produced product the prices are at the rock bottom if we have to compare to Zigbee or Bluetooth. WiFi stack require resources though and not quite good for smallish 8bit populary hobby processors, this is why UART-to-WIFI solutions were made and become popular. Texas Instruments released CC3000 which cost about $20-25 in single quantities and $10 in volume. It took no longer and Chinese company Espressif released their ESP8266 highly integrated UART-WIFI bridge IC, it requires just quartz crystal and balun to make WIFI module, their reference design is with just 11 x 12 mm board space! And of course this comes at Chinese prices: you can buy ESP8266 module in single quantity from Seedstudio for $6.95 or from Alibaba for $5! On top of this you can easy connect devices to Internet and send and receive data through UART! This will definitely wipe out the $50-60 Arduino WIFI shields and even Microchip’s MRF24WB0MA etc modules. We are going definitely to release MOD-ESP8266 which to connect to all our boards with UEXT and give possibility to connect to Internet with simple AT commands! With MOD-IO2+MOD-ESP8266 for instance anyone could make WIFI enabled relay and Inputs and monitor through web page the inputs and drive relays for extremly low cost! if you have Linux the route is easy there are very cheap WIFI USB dongles, this one if good for smallish 8bit processors like the AVRs, PICs which have just few KB of RAM and Flash, it hides the WIFI stack with all complexity behind simple AT command set, for EUR 3 you add Internet connectivity to any 8-bit project! It also generalises to the AT protocol which means one, simple device driver instead of the confusion of drivers still plaguing Wi-Fi devices. This helps no end with less well-supported executive programs. The lack of readable English documentation is going to be a problem – for awhile anyway. But this is quite interesting. This gives a new life to the Arduino 8bit development for sensors and actuators. The shield WiFi have always been ultra expensive. Olimex why do not do a complete product in the price range of the 10 euro like Arduino Mini Pro (maybe even with the LiPo charger)? There are also 6 GPIOs available on the chip itself, probably multiplexed or not with the JTAG port. I wonder what a JTAG scan would give over there. This module is really interesting due to its price. I was looking at it a week ago, but not finding much datasheet, but also design example make me turn elsewhere. If Olimex use this thing in a real solution, it will be really appreciated, many IoT designers will start buying them. 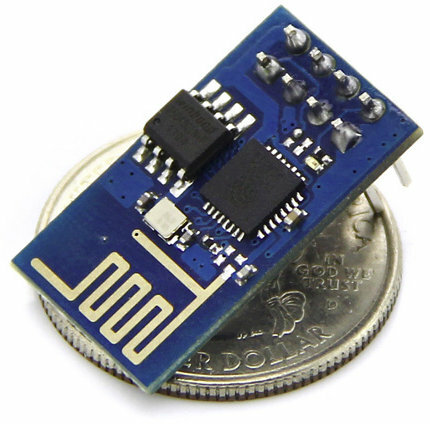 I was thinking to use the nRF24LE1 chip (RF + MCU 8051), because it’s cheap and allowed to create a network of small devices for an IOT project, but now with this new chip, the things can be connected directly by wifi. Same here. A lot of NRF24 devices in the past. ESP8266 now open WiFi world at the same price. We need better modules, at least with external antenna connector. We are on day 1. But most of the critical files are blobs, no source code. Reading over the source and tools lead me to conclusion that this product uses Tensilica core. I saw mentioning of “xtos” (which is tensilica runtime, “os”) and some “xt-” prefixes. Also, there is a gcc port for Tensilica cores. Read this thread – it is possible to build GCC for this chip.